We are excited to announce that Lisa Sypal has joined Bright Lights as our new executive director. Lisa most recently worked for the Alzheimer’s Association of Nebraska and has also held positions with the American Cancer Society and the American Lung Association. 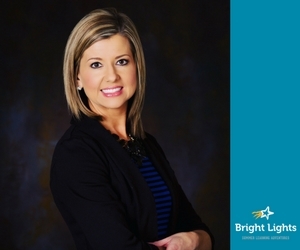 Brandy Johnson, Bright Lights board president, said, “We're looking forward to Lisa joining the Bright Lights team and continuing the tradition of providing hands-on summer learning opportunities for Lincoln's youth." As our executive director, Lisa will be responsible for providing direction for the entire program as well as planning, organizing and directing activities with the staff and board of directors. “I am so excited to join the Bright Lights team and am beyond grateful for the opportunity to lead such a wonderful organization,” said Lisa. Lisa and her husband, Bryan, have an almost four year old daughter, Ellaina. She is excited to not only see her daughter participate in Bright Lights in the coming years, but to also be a part of the experience for the thousands of other students in our community. Outside of work, Lisa enjoys running, relaxing, volunteering and spending time with family and friends. Please join us in giving Lisa a very warm welcome. We are so happy to have her as part of the team!